Offered comprises vertical type screw filling machine that finds suitability for meeting the requirements f packaging items like flour, milk, powder and other. Further, its 304 grade stainless steel construction finish also makes these provide for lasting performance. 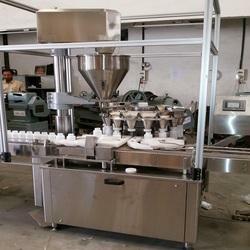 Some of its features include allows for auto filling and measuring support, bag-making system adopting step motor with high precision working; advanced heating sealer with 4 sides of heating control, intelligent photoelectric controller system, adopt new hopper sets that offer easy adjustment and cleaning support. 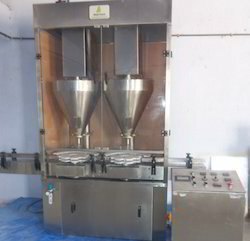 Dry Syrup Filling Machine offered comprises vertical type screw filling machine that finds suitability for meeting the requirements f packaging items like flour, milk, powder and other. Further, its 304 grade stainless steel construction finish also makes these provide for lasting performance. Some of its features include allows for auto filling and measuring support, bag-making system adopting step motor with high precision working; advanced heating sealer with 4 sides of heating control, intelligent photoelectric controller system, adopt new hopper sets that offer easy adjustment and cleaning support. Rotary Powder Filling Machine offered provide for faster and stable performance working support and support the demands of enhancing production efficiency a well as reducing production costs. Further, the technically advanced and easy to understand and operate PLC control also ensures precise and easier handling support. Some of its features include high quality and accessory support for consistent working performance, suitable for pesticides, glucose, powder material like coffee powder, spices, and others; can also be offered with support of optional accessories as demanded by the customers. The powder stored into the powder hopper is agitated by pair of mechanical agitators for maintain consistency and uniform bulk density, powder wheel rotates at the pre-set speed below the powder hopper with no clearance. Powder wheel consist of piston in each port and behind the powder wheel vacuum plate is provided and there is no clearance between powder wheel and vacuum plate due to back spring pressure. Precise volume of powder is sucked into the port of powder wheel during vacuum according to the piston length.